Every Thanksgiving, my grandmother and I have the tradition of making seven layer bars for the rest of our family to enjoy for dessert. The recipe we use has been passed down from generation to generation, with my grandmother having learned the recipe from her mother. When my mom used to make them with my grandma when she was little, she would bring them to her cousins whenever she went to visit them. Her cousins would always ask for the recipe whenever they ate them, but my mom and grandmother always kept it a secret, making this a special recipe just for the women in our immediate family. The seven layer bars are a Herz holiday staple. 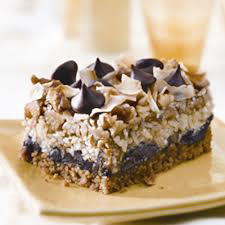 My mom still says that one of her fondest memories growing up was making these seven layer bars with my grandmother. I would have to agree—Thanksgiving wouldn’t be Thanksgiving without them. The bars are delicious. They come out of the oven gooey and chewy. The combination of the coconut with the different types of chocolate chips is so tasty, and the best part about these is that they’re so easy to make. I’m probably the worst baker in the world, and these always taste awesome. I first learned how to make these bars when I was eight years old, and if it was manageable for an eight-year-old, then it will be manageable for you. It takes less than 30 minutes to whip up these delectable treats, and they look much fancier than they actually are. Pro tip: It may seem obvious, but make sure all of your ingredients are fresh and straight from the supermarket. Once, my grandma and I made these using expired condensed milk and they turned out inedible and disgusting. As long as you stay away from that, these will turn out so well that you won’t be able to eat just one. Start by preheating your oven to 350 degrees Fahrenheit. Then, take a 9×9 pan and line it with foil. Spray the foil with nonstick cooking spray. Once you have the 9×9 pan prepared, take out a baking sheet and spread the coconut out on the baking sheet. Pop that in the oven until the coconut turns a light golden brown, stirring it every four minutes to prevent burning. Once the coconut looks good, take out of the oven and set the baking sheet aside. Now, take a small bowl. Melt the butter and combine it with the graham cracker crumbs. Take a spoon and stir the mixture together. When everything is evenly distributed, press the crumbs evenly onto the bottom of the 9×9 pan. In order, sprinkle the walnuts, chocolate chips, white chocolate chips, butterscotch chips, and coconut over the graham cracker crumbs. Then, pour the condensed milk over the entire dish. Bake until the top is golden brown, which usually takes about 25-30 minutes. After you take it out of the oven, leave it out to cool for about an hour. Voila! There you have it, your very own seven layer bar. Be prepared for all the compliments you’ll get when you make these: trust me, there will be a lot.